When I found that I could earn college credits by taking judo, I jumped at the chance. I’d been taking karate for a couple of years, and I was pretty good at it, if I do say so myself. I was used to getting punched and kicked, so I figured judo wouldn’t be any big deal. As I entered the first class, I felt pretty confident. The instructor gave me a hearty welcome and explained that judo was basically like wrestling. I paired up with a guy about my size, and the instructor said to “give it a go.” My opponent quickly grabbed me and flipped me over his back and onto the mat. The pain was excruciating. All I could do was lie there in shock. This sure wasn’t karate! If I hadn’t needed the credits to graduate, I may never have gone back. But I did need the credits, so back I went. And in the next class, my instructor taught me something that changed the way I have since thought about all challenges – physical or mental, personal or business. He taught me how to land. Landing in judo involves twisting and absorbing the impact of the fall in your leg and hip while slapping the mat with your hand. Do that, and it doesn’t hurt at all. Once I knew how to protect myself by landing right, I lost my fear of being flipped. 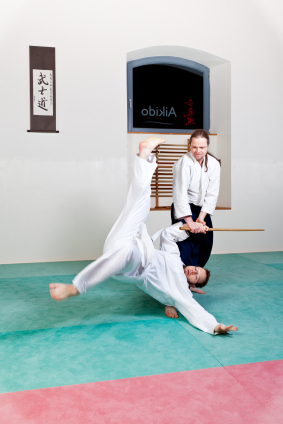 A few weeks later – despite being such a novice – I agreed to participate in a judo tournament. And because I was no longer afraid of getting flipped, I actually won a few matches. It’s amazing how much self-assurance you can suddenly have when you know how to negate the risk of something that had seemed frightening. Of course, learning how to “land” is different depending on the challenge you’re facing. But as long as you know how to minimize the potential “pain,” you can take on almost anything. Here’s another example. When I first began doing stand-up comedy, I was terrified that people wouldn’t laugh at my jokes. My fears, it turns out, were well-founded. I bombed the first time I performed my act in front of an audience. I was so bad, the crowd booed me off the stage. And the agony of that experience dwarfed any physical pain I’d ever felt. Being self-confident can help you get a job, win a new client, or get other people on your side. It can help you try a new hobby, lose weight, or even get a date. By developing an “Antidote Strategy,” you can guarantee that you’ll be at your best when attempting to succeed at just about anything. Identify the possible negative outcome of the challenge. Let’s face it. A lot of things you could do that might help you become more successful are risky. Let’s say you’ve been working on a new project idea. And to show your boss how creative and innovative you are, you want to present the idea at the company’s next staff meeting. But you’re afraid. So Step One of The Antidote Strategy is to determine exactly what it is that you are afraid of. Will you feel stupid if your idea is rejected? Will you be disappointed? Will you be embarrassed? Create or find a way to prevent that negative result. Don’t try to reinvent the wheel. Do some research. Chances are many other people have struggled with the same type of challenge and have come up with a good way to deal with it. No matter how scary the challenge you are faced with, remind yourself that you have nothing to fear. You are prepared. If the worst happens, you have an antidote. A lack of confidence prevents many people from achieving their full potential and reaching their goals. But with your safety net in place, you’ll have a winning edge – the inner strength to take a chance and boldly “jump off buildings”… because you know you won’t get hurt.